Looking for darling cat hoodies for humans (as in, you wear them, not your cat!)? You have to check out my top 10 current favorites. I say “current” because it changes practically daily! If you’re like me, you’ll want to grab a couple of these to help you stay cozy all winter long! Once again, I feel like I should clarify that title a bit! Did you know that they actually make cat hoodies for cats (see the pic above)? Well, actually, they’re usually made for small dogs, but people put them on their cat! While that is insanely adorable, my kitties would claw my eyes out if I ever even so much as thought about trying that with them. 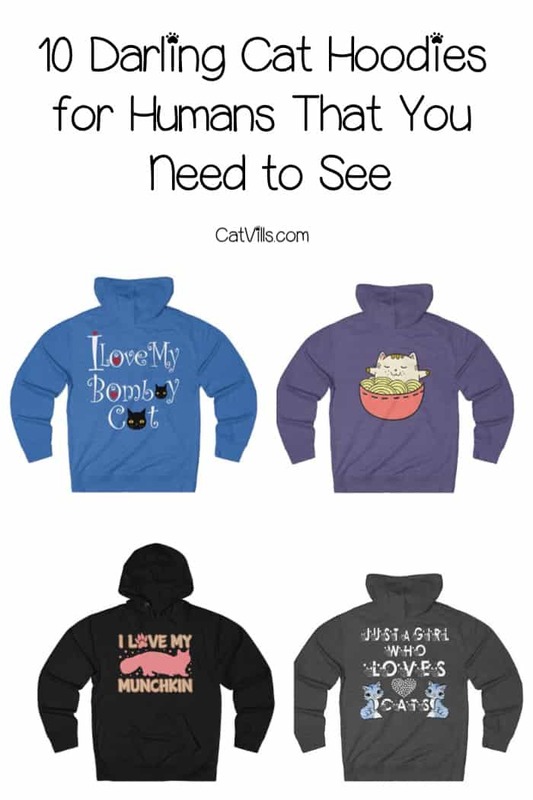 So, if you’re looking for cat hoodies that are made for a human versus your kitty, these are for you! 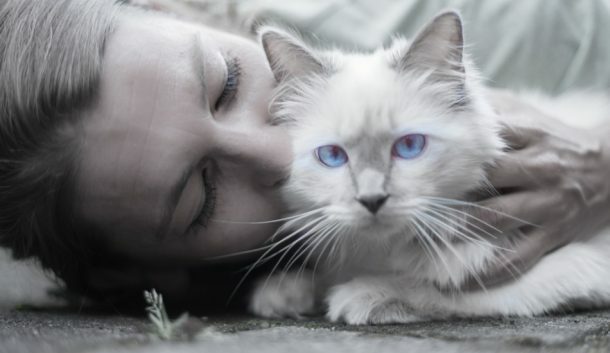 Are you just a girl who loves cats? Then this is the hoodie for you! 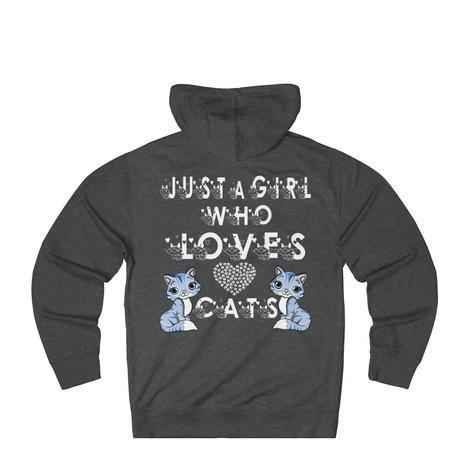 This cute hoodie comes in 7 different colors (the pink is adorable! ), or you can buy it with blue text on black and grey. Aren’t the little kitty graphics beyond darling? One of my all-time favorite cat hoodies for humans may technically be for Halloween, but you can wear it any time of the year! Here’s one thing I love: on a black hoodie, it’s a black cat face. On other colors, though, it can really be any type of cat! Check it out on pink, purple, blue, green, and more! Is this totally you? It’s definitely me! I love talking about my kitties! Grab it in 7 different colors, or get it with a cute cat graphic on it, too! If your idea of a fun Friday night is staying home watching Netflix, curled up with your cat and a glass of wine, this is for you! This super soft hoodie comes in six different colors! Also, did you know we ship worldwide? This one is for that special beer-loving cat dad in your life! It makes a hilarious holiday or Father’s Day gift, don’t you think? Comes in 7 colors, including pink (for those Real Men Wear Pink fans!). I personally love it either on dark grey or blue. Another one of my favorite cat hoodies for humans, this one is also ideal for anime & ramen fans! My son is all about the ramen life these days. He’s 13. Wait until he’s in college and ramen is the only thing he can afford, then we’ll see if he still loves it! If you don’t love the purple as much as I do, it comes in six other colors. Here is a special one for all our Bombay cat parents! The black cats with the hearts and the swirly font is just so much fun, don’t you think? While it comes in six colors, I think it looks great on the blue hoodie. We also have other darling Bombay gifts, so check them all out! Raise your hand if you’re a crazy cat lady! If your hand is proudly up in the air like mine, this hoodie is a must-have! Grab it in all five colors and you’ll be set for every day of the week! The only things cuter than this hoodie are actual munchkin cats themselves! If you want to tell the world how much you love your munchkin, grab this one one (or more) of six colors! Need a cute gift idea for your daughter? Let her tell the world that she’s a proud cat sis…anime style! This kawaii kitty sweatshirt comes in seven different colors. See what I mean about having a hard time choosing a favorite? To make it even more challenging, head to our store and see our entire selection! Then try to tell me which one you love most! Easier said than done, right? So, seriously, which of these cat hoodies for humans is your favorite? Tell me below! I’m sure if we had a cat, my wife would want a couple of those hoodies. We have some friends who are total cat lovers who’d appreciate a share. Oh my goodness these are all absolutely adorable! They would make such a great present for cat parents at Christmas! These would make ideal gifts for cat lovers! A pretty good selection too. Little hoodies for cats are adorable. These are such cute hoodie ideas. I know a few people that would love to receive one of these. Great holiday gift! I need these! I’m a total cat person. My daughter would love them too. She definitely loves her animals. My bestie loves her kitties to the moon and back (I mean, who doesn’t?!) and so I need to gift these hoodies to her for Christmas. She’ll love it to lounge around in! I know a few people that would love these! I’ll have to check them out. My 11 year old daughter loves all things cats and so of course she loves cat hoodies! Hers though have to have the cat ears on the hood too! One could of course sew cat ears on to any of the cute ones you shared here! My daughter and my sister are both crazy over cats. I’m sure they would love most of these hoodies! So cute! Most shops near our place only sell clothes for dogs. I never thought some designs can be worn by cats as well. I bet it would look cuter for humans and their furbabies to wear the same design.